Have you ever accidentally deleted a contact from your Google contacts? Did you ever search for a contact that you know you had in there the other day? Have you every wished you could bring back that missing contact? Did you know you can? 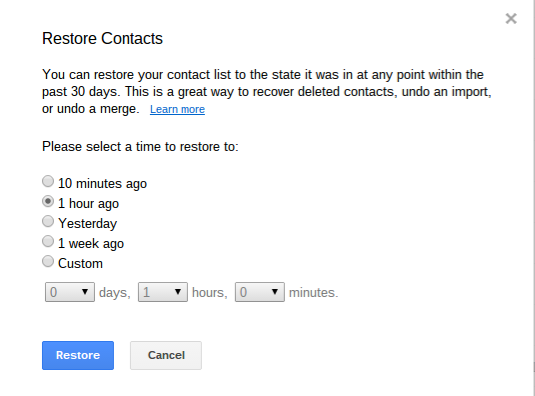 With Restore Contacts in Google Contacts you can do just that. This process allows you to restore the Google contacts to the way it was up to 30 days in the past. Just choose your options and click on Restore. Note: You can undo this restore immidiately by clicking on the Undo in the notification bar at the top of the screen. If you missed the notification, you can always just restore again to the time right before the restore you just performed.